Their early albums, such as ‘Panzerfaust’ (1995) or ‘Transilvanian Hunger’ (1994), clearly made references to fascist, Nazist and racist ideologies. Still, there is a lot of dispute and discussion if this is to be seen as ‘provocation’ or as ‘authentic’ political statements. The latter album even had printed ‘Norsk Arisk Black Metal’ (‘Norwegian Aryan Black Metal’) on it. So, from my point of view, this aspect of the band’s cultural history is to be seen more than critically; it has to be rejected. In Black Metal discourse, as an artistic and ‘rebellious’, therefore, emancipative discourse, there can be no discursive space for racism. This said, there is a an aspect in the band’s cultural history of identity, taking a very clear form in the aesthetics of ‘Arctic Thunder’ (at this time, the promotional release of the album is available already). 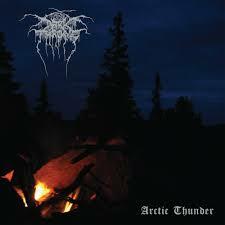 Darkthrone started out as a Death Metal outfit in 1986, turning to Black Metal aesthetics in 1991. The ‘blackish’ design of the band’s identity, claiming it to be a ‘true’ Black Metal group, was kept up to around the year of 2005; with the album ‘The Cult Is Alive’ (2006), the two artitsts decided to incorporate Punk, Rock and Classic Metal elements into their music. They became a ‘Black’n’Roll’-band which they can be seen to still be in 2016. This cover’s features are, in a cultural ‘micro-macro’ perspective of the band’s history of identity, very interesting – and, special. The cover shows dark woods, fire (I guess, a campfire), the band’s logo and the record’s title. This is a very straight codification of early 1990’s Black Metal aesthetics: the topics and metaphors of fire and woods have become standout topics of Black Metal in its cultural orthodoxy. But, when looking back at the band’s classical records from 1991 to 1995, they all had a black and white outfit. So, what is, in a certain way, the key move on ‘Arctic Thunder’ is to use a orthodox, very traditional and classical black metal identity but to paint it colourfully. This move can be seen in both ways, literally and metaphorically: literally the band follows, now, a more colourful approach in their aesthetics of identity. Metaphorically, and this is from the mentioned ‘micro-macro’ perspective of history the more interesting one, the band breaks classical Black Metal monochromy and re-composes it in colour. 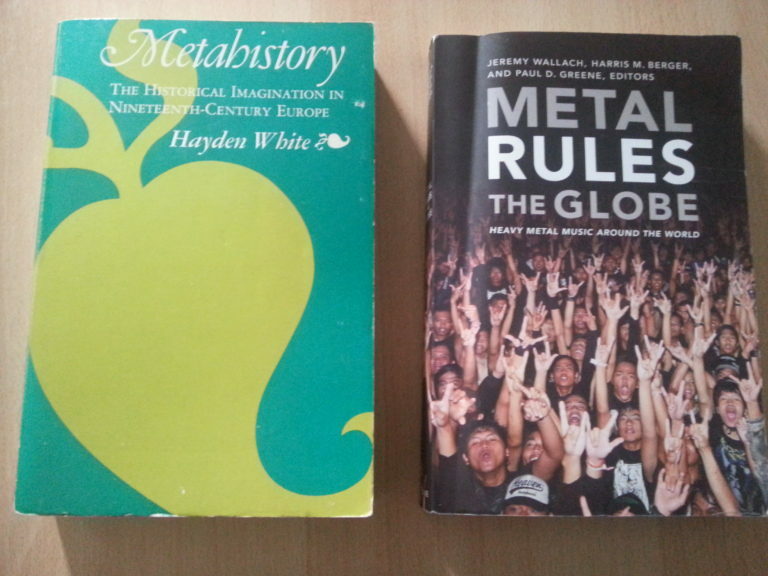 Black Metal is – self-conciously, and, somehow, courageously – hybridized with Rock’n’Roll. The band did so since ten years but, in 2016, they start to do it more explicitly. So, from this allegorical perspective, we can see a new era beginning in the group’s cultural history of identity. In 2016, the band plays ‘colourful Black Metal’. So, reflecting on it in a broad cultural historical perspective, this is a tempting move. In 1966, exactly fifty years ago, the Rolling Stones wanted to ‘paint it black‘, releasing a single of this title. In 2016, the seemingly most extreme one of popular music cultures, Black Metal, at least one of their key-players, wants to ‘paint it colourfully‘. I am eager to see and listen what kind of broader trends in cultural history this can be seen to represent metaphorically. This entry was posted in Artikel, Populärwissenschaftliche Artikel and tagged Arctic Thunder, Black Metal, Colourful Black Metal, Cultural History, Darkthrone, identity. Bookmark the permalink.